You probably won�t want your kids playing with this Lego set anytime soon. 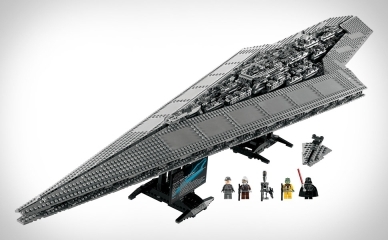 This September, be prepared to spend around $400 to get your hands on your very own Lego Super Star Destroyer. This 3,000 piece marvel weighs in at around eight pounds, and the completed ship will measure 50 inches in length. Five mini Lego figurines are also included in the set: Darth Vader, Admiral Piett, Dengar, Bossk and IG-88. The Lego site warns that each customer will only be allowed to purchase five Lego Super Star Destroyer sets — but do you really need more than five ships to conquer a galaxy, anyway? Just a wild guess, but you can probably assume that most of the pieces in the box will be gray. OMG! I bought the imperial star destroyer 10030 as soon as I herd about it after I finished it in 23 hrs straight I droped it twice trying to get it onto my shelf I want to use it in an animation but i’m scared to take it down I think I’ll lose count of how many times I drop this probably more times than my dropship!